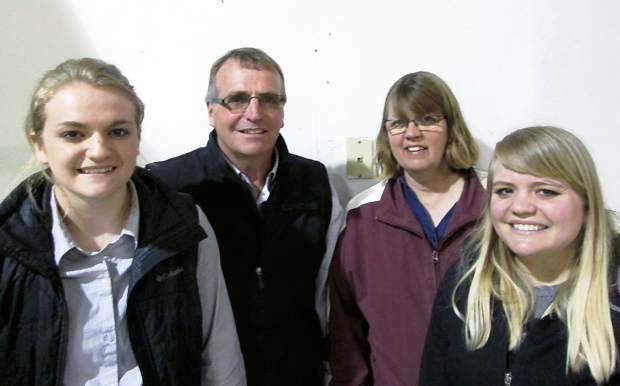 Sawyer, Tim, Sandy and Rebecca Naasz, owners of TSN Simmentals near Platte, South Dakota. TSN Simmentals, owned by Tim and Sandy Naasz, their daughters, Sawyer and Rebecca, and Shad, hosted a nice crowd for their annual bull sale at Platte Livestock. Most of the crowd were repeat buyers and neighbors who were also buyers. I thought this was a really strong set of bulls. Very gentle, containing a lot of volume, they were very good on their feet and legs. Packed full of muscle, they looked like they would sire cattle with extra grade and yield. The bulls were not overfed, and were presented in modest condition. I've been told several times that Tim and Sandy are very good to deal with, and the buyers seemed very willing to bid on the bulls that they picked out. Top selling bull of the day was Lot 27, selling for $8,000 to Leachman Cattle from Colorado. He was TSN Prophet C366, a son of GAR Prophet, and out of a Top Grade daughter. He was half Simmental and half Angus. With a 75 pound birth weight, he weaned at 624 pounds to ratio 103. His EPDs were CE 16, BW -2.0, WW 74.5, YW 124.9, MILK 32.2, MARB 1.47, REA 0.73, and CW 41.5. He had an API of 199.2 and TI of 109.1. Lot 31 sold for $6,750 to Wally Zylstra from Geddes, South Dakota. This son of Prophet was out of a Triple C Singletary daughter. He hit the ground at 87 pounds, weaned at 643 pounds, and posted a present day weight of 1,208 pounds. He was black and polled, being half Simmental and half Angus. His EPDs were CE 14.3, BW -0.2, WW 79.7, YW 128.8, MILK 32.5, MWW 72.3, CW 46.1, MARB 1.19, and REA 0.76. He had an API of 176.9 and a TI of 102.5. Doug Roggow from Gregory, South Dakota, bought Lot 20 at $6700. This was another son of Prophet, and he was out of a daughter of TNT Ever Ready. His EPDs were CED 16.9, BW -1.0, WW 80.3, YW 131.9, MILK 26.9, MARB 0.98, and REA 0.95. Born at 77 pounds, he achieved a weaning ratio of 103. His API was 174.9, and he had a 14.3 square inch ribeye. Lot 28 sold for $5500 to Dean Schrag from Parker, South Dakota. He was by ASR Augustus and out of a daughter of Mytty In Focus. He was ¾ Simmental and ¼ Angus. His EPDs included BW -1.9, WW 59, YW 98.7, MILK 20, and REA 0.81. Tom Freidel from Ethan, South Dakota, chose Lot 30 at $5,250. This son of CCR Frontier was a half blood bull, with a 76 pounds birth weight. This good looking bull ranked first of his contemporaries for REA. Lot 19 brought $5,250 from Jim Munsen from White Lake, South Dakota. This black polled bull was a son of ASR Augustus and out of a Triple C Singletary daughter.